I just noticed a bald spot about the size of 2 half dollars on my Maltese right shoulder. It is warm and feels as if it has fluid inside. All the hair is completely gone in that area and there is a small red circle in the middle about the side of 1/4 inch. What could that be? I haven't noticed him picking at it and this is the first that I have seen it. I will email a picture. Thank you. This is definitely not a "normal" thing to see on a dog. Unfortunately though I can't say with certainty what it is. If there really is fluid inside of this then it's possible that it is something called a seroma which is sort of like a large bruised area. However, it's hard to say why a seroma like this would have hair loss. Usually when there is a large bald spot on a dog it means that the hair has been groomed or pulled off. 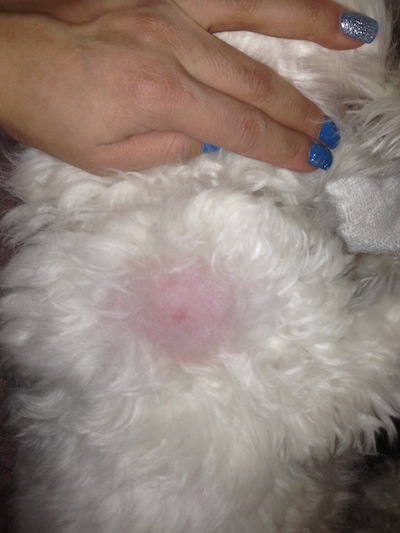 If the red spot is irritating, it's possible that Pongo has chewed away the fur around it. Is it at all possible that another dog has nipped at Pongo? I could see this as a possible explanation. It is also possible that this is an insect or spider bite. Ringworm, which is a fungal infection could possibly look like this but this is not the most likely explanation. It's hard to advise you on what is best to do at this point. I think if it is not bothersome to Pongo it's ok to keep an eye on it for now. I would measure the size of it and watch to see if it is getting bigger. If so, then I think I would have a vet check it out. Or, if it seems like it is getting bothersome, then I would have it checked sooner. Thanks so much. I made an appointment for Tuesday, that's the earliest they could give me. I am happy it's doesn't look like anything to terrible. He isn't picking at it at all. When I touch it, it does seem to bother him. The area of hair loss has gotten bigger and he ripping out the hair. I have had him with me all day. But he is acting normal, no vomiting, and he is still eating and drinking normally. I hope it isn't anything bad but there is a red dot in the middle which does make it seem like something bit him. Again thanks so much for your information.